In a healthy mouth, the gum tissue or gingiva fit tightly around the teeth. 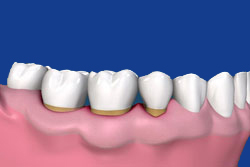 As periodontal disease progresses, the bone is destroyed forming pockets between the gums and the teeth. As the pockets deepen, colonies of bacteria form within the pockets and cannot be removed with conventional home care techniques. If the deep pockets and bacteria are not eliminated, bone loss will progress down the root of the teeth and eventually the loss of one or more teeth will occur. 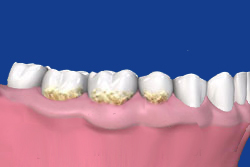 Periodontal disease can result in abnormally deep probing depths which can not be cleaned properly or maintained. At your initial visit, your periodontist will determine how advanced your periodontal disease is by performing a comprehensive examination. The periodontist will measure your periodontal pockets (1-3mm is considered healthy), determine your bleeding index, evaluate your tissue quality and quantity, assess the mobility of your teeth, and finally review your full series of radiographs. The first step to controlling periodontal disease consists of oral hygiene instructions and scaling and root planning. However, if your periodontal disease has advanced beyond the scope of initial therapy, your periodontist may recommend pocket reduction surgery to eliminate the disease tissue, gain access to the diseased roots, and make the affected area more accessible for home care. The goal of pocket elimination surgery is to gain access to the roots and bone and make the area more accessible for home care. In pocket reduction surgery the patient’s gums are gently lifted and reflected away from the teeth and surrounding bone to gain access to the teeth and bone. Then, the infected tissue (granulation tissue) is removed and the teeth are cleaned to remove calculus deposits, bacteria, and toxins. Irregularities in the bone surfaces are recontoured to allow the gum tissue to better adapt and reattach to healthy bone. The gums are repositioned and sutured with either resorbable or non-resorbable suture materials. Finally, a protective dressing is placed around the neck of the teeth to help secure the tissue and provide additional comfort.